Ketoacidosis is lethal. It is responsible for over 100,000 hospital admissions per year in the US with a mortality rate of around 5%. In other words, ketoacidosis is to blame for about 5,000 deaths per year. The cause? A deadly combination of uncontrolled hyperglycemia, metabolic acidosis, and increased ketone body levels in the blood (more on this deadly combination later). Luckily, this lethal triad rarely affects individuals who don’t have diabetes. However, the majority (80%) of cases of diabetic ketoacidosis occur in people with a known history of diabetes mellitus (any form of diabetes). Ketoacidosis vs. Diabetic Ketoacidosis — What’s The Difference? At this point, you may have noticed that I used ketoacidosis and diabetic ketoacidosis interchangeably. This is because it is difficult for the body to get into a state of ketoacidosis without the blood sugar control issues that are common in people with diabetes. Hence, the term diabetic ketoacidosis. 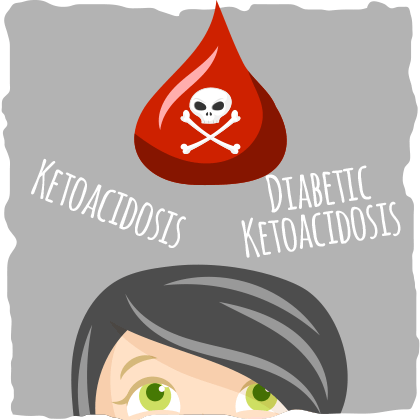 Ketoacidosis tends to occur the most in people who have type 1 diabetes. Somewhere between 5 and 8 of every 1,000 people with type 1 diabetes develops diabetic ketoacidosis each year. Type 2 diabetics also run the risk of ketoacidosis under stressful situations, but it is much rarer because type 2 diabetics have some remaining insulin production (type 1 diabetics do not). Earlier in the article, I stated that ketoacidosis is caused by uncontrolled hyperglycemia, metabolic acidosis, and increased ketone body levels in the blood, but how does this happen? The common consensus in the scientific community is that the main underlying cause of ketoacidosis is insulin deficiency. This can be caused by being born without the ability to produce enough insulin (type 1 diabetes) or living a lifestyle that promotes insulin resistance (type 2 diabetes). When a person has insulin deficiency, their liver and fat cells aren’t listening to and/or receiving the signal from insulin that we have excess energy. This will trigger the fat cells and liver cells to go into starvation mode, even after a calorically dense meal. The fat cells begin to dump triglycerides into the blood to provide the other cells with energy (one of the reasons why some people have high triglyceride levels on their blood test). Meanwhile, the liver will start mobilizing stored glycogen and using gluconeogenesis and ketogenesis to provide the body with sugar and ketones that it doesn’t really need. All of this causes blood sugar to rise to unhealthy levels (uncontrolled hyperglycemia), while the lack of insulin efficiency allows ketones to build up in the blood. The excess sugar and ketones will then start to draw water out of the tissues, into the blood, and out of the body in the urine. With less water in the blood (due to frequent urination), the acidity of the ketones makes the blood so acidic that the body enters a state called “metabolic acidosis”. In other words, the blood becomes so acidic that the body cannot function properly. This causes many of the common ketoacidosis symptoms that diabetics should look out for. Ketoacidosis usually develops rapidly (within a time span of 24 hours). The most prevalent symptoms are vomiting and abdominal pain (which are especially common in children with ketoacidosis). People who are experiencing ketoacidosis will also be dehydrated and have low blood pressure, higher blood glucose, and a higher heart rate. It is also important to be aware of the person’s mental state. In mild ketoacidosis, patients will tend to be alert. As ketoacidosis worsens, the patient will start to feel drowsy and may even lose consciousness. At its most severe, ketoacidosis can put the patient in a coma. 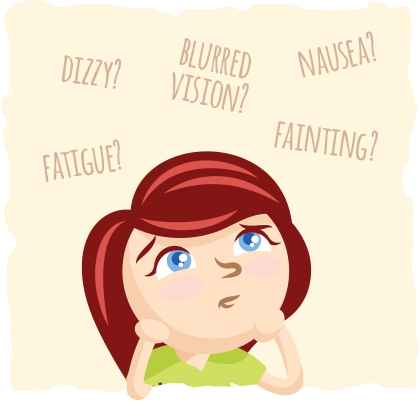 If you have most of these symptoms and you have diabetes, then it is highly likely that you are in ketoacidosis. However, you will not know for certain if you have some of the symptoms of ketoacidosis unless you test for them first. Vomiting, abdominal pain, and drowsiness are self-explanatory, but they can be attributed to many other issues as well. This is why it is important to check for the other symptoms of ketoacidosis before you rush to the hospital. 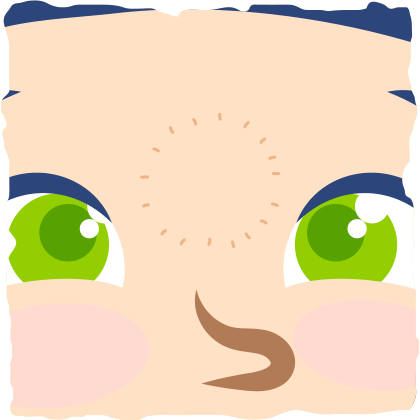 Dehydration can be tested by pinching the skin on the part of your forehead just above and between your eyebrows called the glabella. Does the skin recoil right back after you release it or stay folded for a couple seconds? If it stays folded, then you are dehydrated. The skin that, after being pinched and released, goes back to its original position immediately suggests good hydration. A skin fold persisting for less than 2 seconds suggests mild dehydration. First, make sure you are relaxed and fully recovered from activity before you measure your heart rate. Check your pulse at your wrist by placing two fingers between the bone and the tendon over your radial artery (it is located on the thumb side of your wrist). Start a stopwatch and count how many pulses (heartbeats) you feel under your fingers for 15 seconds and multiply it by 4. This is your heart rate. For example, if you count more than 25 beats in 15 seconds then your heart rate is above 100 per minute. 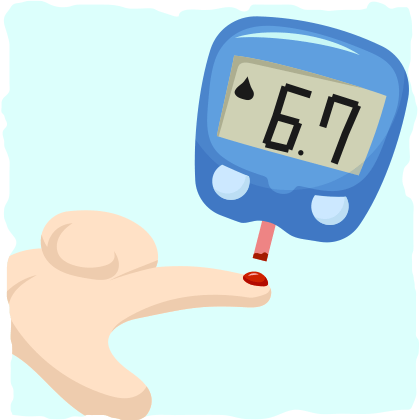 Blood glucose meters are cheap and easy to get nowadays. If you have diabetes or if you are concerned about your blood sugar levels, then it is a good idea to get one. All it takes is a finger prick and a drop of blood, and you’ll have your blood sugar reading. If your blood sugar is above 250 mg/dl, and you have most of the other symptoms on the list, then it is highly likely that you have ketoacidosis. Checking for all of the symptoms of ketoacidosis will take less than 5 minutes, and it will let you know if you may be experiencing the effects of this lethal triad. But what do you do if you have almost all of the ketoacidosis symptoms? Drink plenty of water with a pinch of salt in it, follow the treatment program suggested by your doctor, and continue reading this article. A study on diabetic ketoacidosis published in 2012 indicates that approximately 50% of hospital admissions due to ketoacidosis are preventable with improved outpatient treatment programs and better adherence to self-care. This can mean many things, but the authors of the study suggest that diabetics should monitor their blood sugar levels throughout the day and administer their insulin and medication when necessary. That’s it — preventing ketoacidosis is that simple. However, these guidelines don’t address the millions of people that have blood sugar control issues but have no insulin or medication to help them. What should they do? If you are experiencing mild ketoacidosis symptoms currently, then you must go to the doctor and be put on an appropriate blood sugar control program. Drink water with a pinch of unrefined salt in it and don’t eat anything on the way to the doctor so the symptoms don’t get worse. On the other hand, if you don’t have any symptoms of ketoacidosis, but you want to prevent it from happening, there is an even better approach. The key to preventing ketoacidosis is insulin efficiency. This means that you have adequate insulin, and your cells respond to it when it is released. When insulin is functioning properly, ketones and blood sugar can never build up in the blood and cause ketoacidosis. The best way to improve insulin efficiency is with exercise and the right diet. The concept of exercising to prevent ketoacidosis is easy enough. Simply by moving more, you will cause the cells in your body to be more responsive to insulin and your blood sugar levels to be more stable. If you move more with more intensity (e.g., lifting heavy weights, CrossFit, sprinting), you will improve insulin efficiency even more. Dieting to avoid ketoacidosis, however, is a bit more complicated (at first). Following the typical western diet can easily result in blood sugar control issues, so we need better guidance. Fortunately, many research studies have found that a handful of diets can help improve blood sugar levels and reduce insulin resistance. For example, calorie restriction, the low glycemic index diet, and the ketogenic diet have all been found to improve blood sugar levels. However, one of these diets has been proven to be much more effective than the other two. In fact, it is so effective that it can help reverse diabetes. In other words, if you have type 1 or type 2 diabetes then you should be on a low-carbohydrate diet. But what does this have to do with ketoacidosis? One of the main purposes of the ketogenic diet is to get into ketosis (using ketones for energy). This sounds like a terrible idea after learning about how ketones can help cause metabolic acidosis, but bear with me here. The purpose of the ketogenic diet is to use ketones as one of your main sources of energy instead of dietary carbohydrates. This is done by restricting carbohydrates. Without carbohydrates, the cells become more sensitive to insulin, making insulin more efficient. After around 3 days of carbohydrate restriction, the cells go into starvation mode. The liver creates ketones and the fat cells release triglycerides to be used as fuel. This is a similar process to what happens before the body goes into ketoacidosis, but with one important difference. During carbohydrate restriction, blood sugar levels are completely under control. With blood sugar at healthy levels and insulin working efficiently, ketone levels will not get too high because the liver now has an accurate idea of how much is needed to fuel the body. This allows the liver to decrease ketone production before metabolic acidosis occurs. To make a long story short, by preventing or reversing diabetes with the ketogenic diet, you can prevent ketoacidosis from happening as well. Exercise is one of the simplest ways to lower your blood sugar levels now and in the future. 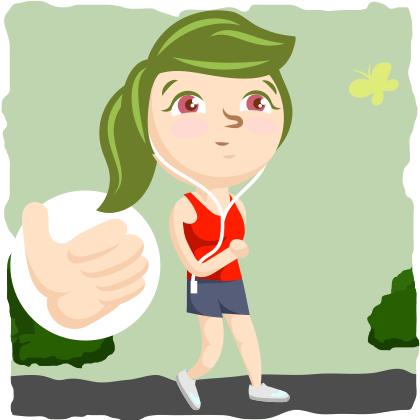 One study found that going for one 25-60 minute run can improve insulin sensitivity for up to 5 days (in younger women). Resistance training seems to have similar (if not better) effects as well. In general, if you move more, your body will need to use more energy. The more energy your body uses, the more it will need to increase insulin sensitivity in the cells that need it most (i.e. your muscle cells). This is essential for promoting health and preventing diabetes and ketoacidosis. Start with whatever activities you enjoy doing and make it a bit more challenging. If you like going for walks, then see if you can walk a bit faster or up more hills. If you like to lift weights, then increase the volume or the intensity. If you don’t like doing any form of activity, then go for a short walk. Any activity is good (as long as you don’t do too much at once). Another way to prevent ketoacidosis is to reduce stress. Whether you are stressed because you are being attacked by a snake or because you have a fear of snakes that was triggered by reading the word “snake”, stress hormones are released into your blood stream. These stress hormones trigger a rise in blood sugar levels and an increase in insulin resistance. If the short-term stressor doesn’t go away and you are stressed most of the time, then your likelihood of getting type 2 diabetes and ketoacidosis raises dramatically. There are many tools you can use to relieve stress, but meditation (not medication) and deep breathing are the healthiest and most reliable. Meditation, by itself, can help reduce blood sugar and stress levels. When you combine meditation with slow, deep breaths into your abdomen, your stress response will melt away. Ketoacidosis is a serious issue that can become lethal, but it is preventable (in most cases). It occurs when blood sugar levels and ketone levels are simultaneously too high. As a result, common ketoacidosis symptoms like vomiting, abdominal pain, dehydration, hyperglycemia, hypotension, tachycardia, and drowsiness can occur. Ketoacidosis almost always occurs when a person with diabetes isn’t mindful of their blood sugar levels. This is why the best short term prevention strategy is to monitor blood sugar levels and take diabetes medication when necessary. If you are a diabetic and you are experiencing almost all of symptoms of ketoacidosis right now, then it is best to go to the doctor (or the hospital if you are continuing to get worse). For those of you who are concerned about getting ketoacidosis in the future, there is no need to worry. You can prevent ketoacidosis completely by making simple lifestyle adjustments. The most effective preventative strategies are exercising, meditating with deep breathing, and restricting dietary carbohydrates.